Okay, get them out - those cute feet - grab your digital camera and snap some shots of those ten cute piggies! We've launched our first ever photo contest - and you have the chance to win $500 in cash! 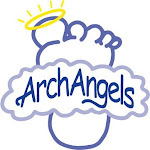 Please take a minute and look at the contest rules, at www.myarchangels.com, and enter today. I can't wait to share some of these great photos with you.